With four releases and countless tour dates under their belts, you would be forgiven for thinking Hearts Under Fire were old timers on the UK scene. The 4-piece found time to speak to ATP about line-up changes, recording new EP 'Letters' with Outcry Collective's Sam Burden, worries about their change in sound and more. Alter The Press: For anyone who's new to you, how would you describe your sound? Hearts Under Fire: We’ve been deliberating on the best way to answer this question & we’ve decided that the best way to describe our sound is to mix the new wave of pop punk/rock (You Me At Six, The Audition) with the darker punk rock (Alkaline Trio, AFI), throw in some DIY punk rock, gang vocals, lots of energy & a huge amount of passion & there you have it – the Hearts Under Fire ingredients. ATP: You recently released your EP 'Letters', how has the reception been so far? HUF: Amazing! We’re so happy to have had such an awesome response. We were slightly worried that fans would be put off by the change of direction and sound but we’ve had a hugely positive response & we’re so grateful that our fans have stayed with us, as well as gaining new ones. ATP: If you had the chance, would you change anything about the record? HUF: We wouldn’t change anything, we’d just liked to have recorded more songs, but unfortunately we didn’t have the funds. ATP: You worked with Outcry Collective's Sam Burden, what do you think he brought to the table? HUF: Sam Burden is hands down the best producer we’ve ever worked with. So many awesome ideas & he just completely understood the sound we were going for. We worked & vibed so well with Sam, it was an absolute pleasure to record with him. Unlike a lot of producers Sam was not one bit controlling over ‘our baby’, but so up for trying out our ideas, his ideas & combining the both! ATP: Give us a run through of the band's creative process in writing material? HUF: We jam like a sandwich! Honestly though it does tend to be a jam session, or we’ll work on someone’s idea, we just feed off each other you know, we write the best songs when we’re all together. ATP: Would you say the EP is a progression in sound from your previous work? HUF: Yes, definitely! It’s a huge progression for us. It still has the typical Hearts Under Fire sound, but you can tell how much we’ve grown & how diverse our influences are. We’ve basically grown up & you can definitely hear it through our music. ATP: You've had some line-up changes to deal with, do you feel you've found a set up that works now? HUF: For sure! Yes, we’ve had a couple line up changes but we’ve finally found one that works & we’re bloody sticking to it. A lot of people have actually commented on the fact that we’ve finally found the right ingredients you know. ATP: You've been described in certain circles as a "female Rise Against", which must be flattering, but is there pressure that comes with such comparisons? HUF: We don’t feel pressured at all purely because we’re not trying to recreate their sound, it’s a huge compliment if anything, but we’re not trying to sound like anyone else. You can certainly hear our influences, but we want people to listen to our songs & think wow it’s got that Hearts Under Fire sound. ATP: The band has been around, do you think the experience that comes with six UK tours and four releases holds you in good stead? HUF: Having experience definitely puts you ahead. This industry is not really a nice one, so the more experience, the wiser you become. It’s one big journey, a difficult one but bloody exciting! 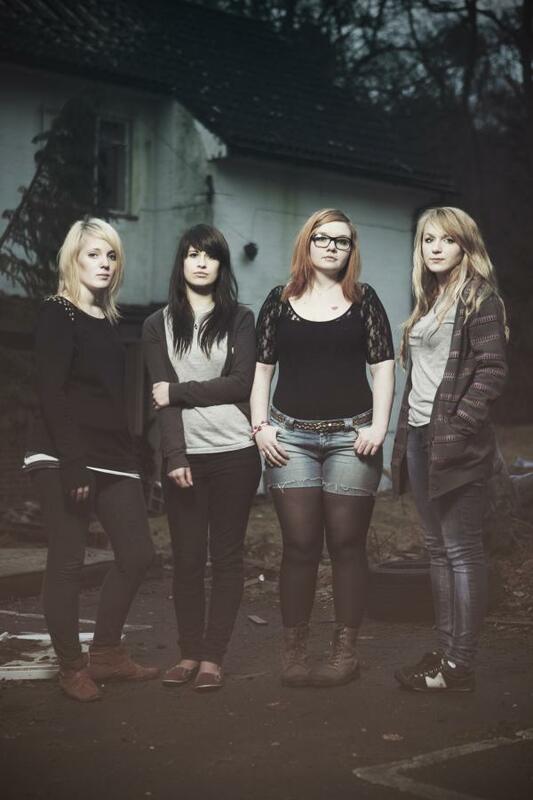 ATP: As an all female band, do you embrace the "girls representing punk-rock" label, or would you rather steer clear of that? HUF: You know being a ‘girl band’ (a term we try to stay away from) has it’s good sides & bad sides. We certainly don’t ignore the fact that we are girls, but we don’t put it in everyone’s faces. Anyone who knows HUF knows that we’re completely in this for the music. ATP: Why should people come and check out Hearts Under Fire? HUF: People should check out Hearts Under Fire because we are just that little bit different to all the bands around at the moment. More importantly though, every performance we do is completely real, we don’t put on any fancy act, it’s just raw, honest & passionate. HUF: We’re starting to write our debut album, which is so exciting! We want to get as much exposure as possible & get our music out to as many people as possible. So 2010 is about writing, touring & spreading the word of Hearts Under Fire! 'Letters' EP is available now through the bands online store.